Don’t you love a provocative title? As usual, I’m relying on hyperbole (or, as Brian Regan would mispronounce: the epitome of hyperbole). Or maybe not. My meaning behind this title is that the computer is no longer oriented to… well, computing. It’s been completely co-opted by TV. Everything about the computer – including all variations thereof: laptop, tablet, phone – is now oriented toward watching TV. (Movies, too, but the line between the two is getting blurred.) As a writer, I find this personally troublesome. First of all, the aspect ratio for monitors is now the same as a TV set, 3:2, and in “landscape” mode. (A lotta people looking at landscapes on their computers, are they?) That’s really bad for nearly every other use of a computer. For instance, most web pages are vertically oriented, though I suppose that will change pretty quickly. The most detrimental effect is on writing. Paper (remember paper?) is predominantly vertical. That won’t change. Reading long horizontal lines is a nightmare. That’s why papers, books, and virtually all printed matter is in “portrait” mode. Tough. TV now dominates human discourse, not reading or writing. I had to submit to this TV tyranny last year when my old laptop (real keys, square-ish screen) crashed and there was no other option. When I asked the salesperson why I couldn’t get a real keyboard or a portrait (or at least square) monitor, he told me about the whole TV sea-change. How did I not see that coming? I acknowledge that there are minor advantages to each of these regressions. Wide spreadsheets are more easily viewable on landscape monitors and the flat keyboards make for a more compact unit, though only in terms of thickness. Because of the widescreen monitor, the laptop I have now is so wide I feel like I’m carrying a surfboard. Is no one doing real work on computers anymore? Are businessmen, instead of writing documents, watching reruns of “Laverne and Shirley”? And for those watching movies on their laptops, iPads, and phones: How do “Lawrence of Arabia” and “2001” look on that 3-inch (or even 9-inch) screen? Yeah, I love squinting for 2-hours. 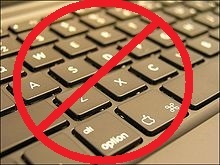 Here’s my idea: Couldn’t someone make a “writer’s laptop” with a real keyboard and vertical monitor? If I have to deal with this expansive monitor anyway, why not make one tall instead of wide? I’d gripe more, but my fingers are aching from reaching across the gaps between the chiclets. That cuts this post short – another upside, I guess. This entry was posted in Film, General, Writing and tagged aspect ratio, chiclet, keyboard, landscape, laptop, monitor, movies, pc, portrait, TV, writing. Bookmark the permalink.